Formation of blood requires small proteins, denoted cytokines that carry information from cell to cell and induce cell survival and growth. They act by binding on the surface of target cells to "receptors", which function like antennae that transmit a signal to the cell interior and ultimately to the nucleus, where the choice of expressed genes is made. We study how these specific receptors assemble on the membrane and couple at the cell interior to other proteins, such as Janus Kinases (JAKs), which transmit the signal. We found that mutations in these proteins, JAKs, or in receptors themselves confuse the cells and make them grow indefinitely, leading to blood cancers. The JAK-STAT pathway. The human genome codes for more than 30 small proteins called cytokines that circulate or act on neighboring cells to regulate survival, growth or differentiation. They act by specifically binding to receptors on the surface of target cells. 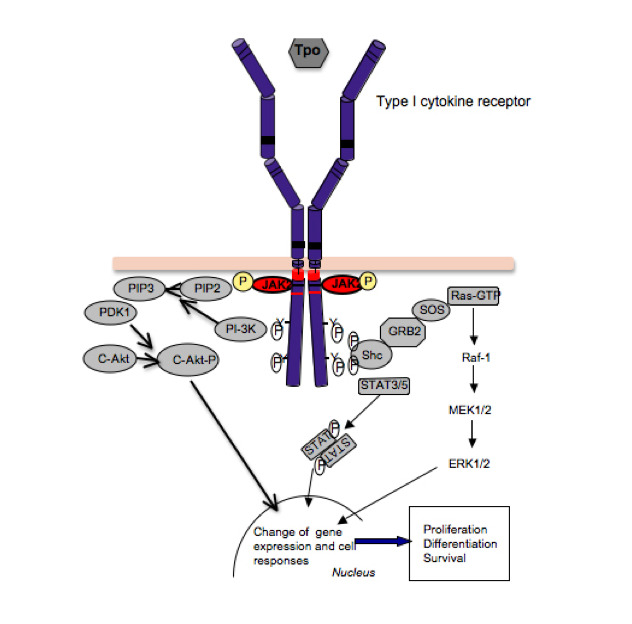 Response to one particular cytokine will depend on expression of the specific receptor. The signal cytokines transmit emanates from dimerization or oligomerization of receptors, which bring together- close enough- their cytosolic domains, which are pre-bound to Janus kinases. Those are tyrosine kinases that are appended to precise sequences of the receptors at the interior of the cell, and this interaction is not covalent. Physiologically, receptors are forming complexes with JAKs before arriving to the cell surface and are inactive in the absence of the cytokines that normally bind to the receptors' extracellular domain. Usually cells expose between 500-2,000 receptors of one kind of cytokine per cell surface. When the cytokine arrives, for example erythropoietin (a growth factor for precursors of red blood cells), it binds to the extracellular domain of EpoR (the specific receptor), which leads to a conformational change from an inactive dimer to an active one. We have determined the nature of this conformational change to involve a rotation of the receptors so that a particular interface of the transmembrane domains is formed. Once this happens, the JAK2 proteins appended to the cytosolic domain of the receptors come really close and can phosphorylate each other on tyrosine residues, which then leads to activation of the enzymatic activity of the JAKs. In turn, this leads to the phosphorylation of tyrosines in the cytosolic domain of the receptor. Those attract signaling proteins that have affinity for phosphorylated tyrosines. Once bound to receptors, such proteins become phosphorylated themselves, because they are close enough to JAKs. A prominent class of proteins that behaves in this manner is represented by STATs (Signal Transducers and Activators of Transcription), which upon phosphorylation are dimerizing and moving to the nucleus, where they regulate gene expression. In short, the JAK-STAT pathway starts with cytokine receptors, goes through activation of JAKs (there are 4 Janus kinases coded in our genome) and ends with activation of STATs (there are seven STATs coded in our genome). Dependent on the particular receptor, the precise JAK and the STAT proteins that are activated will change, but the paradigm remains the same. 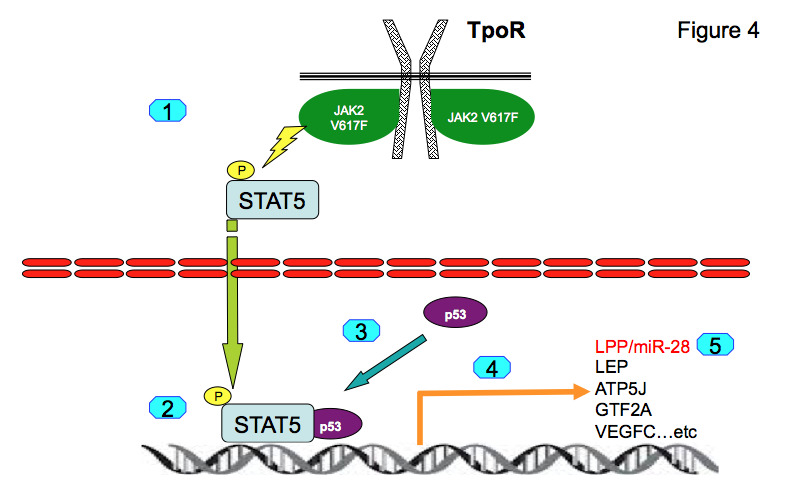 In addition to the STATs, several other adaptors and signaling proteins are attracted to JAKs and phosphorylated receptors, such as adaptors that activate Ras-MAP-kinase and phosphatidylinositol-3'-kinase-Akt/Protein kinase B pathways (Figure 1). The genome of the cell, embedded in the chromatin will receive a combined signal, represented by the activated STATs and other activated pathways, and usually this signal has a profound effect on the types of genes that are expressed and is translated by changing the rate of survival, growth and differentiation of precursors for different blood lineages, or of mature immune cells. 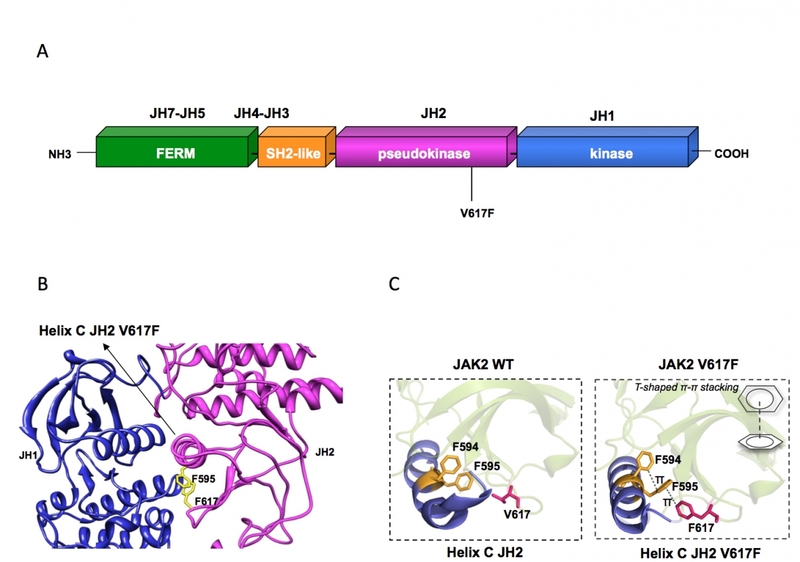 Our laboratory and others have described interactions between JAK proteins and receptors that occur before receptor activation, and that are important for traffic of the receptor to the cell surface. We have shown that many receptors are maintained inactive and dimerized (assembled in pairs) by interactions between transmembrane helices, and that upon activation, receptor monomers are rotated and this leads to a rigid helical rotation of the juxtamembrane cytosolic regions, which determines activation of JAKs. Finally, we have discovered mutants in receptors (such as in receptors for erythropoietin (EpoR) or thrombopoietin (TpoR)) that allow active dimers to be formed and signal constitutively. This activation is inducing cancer. 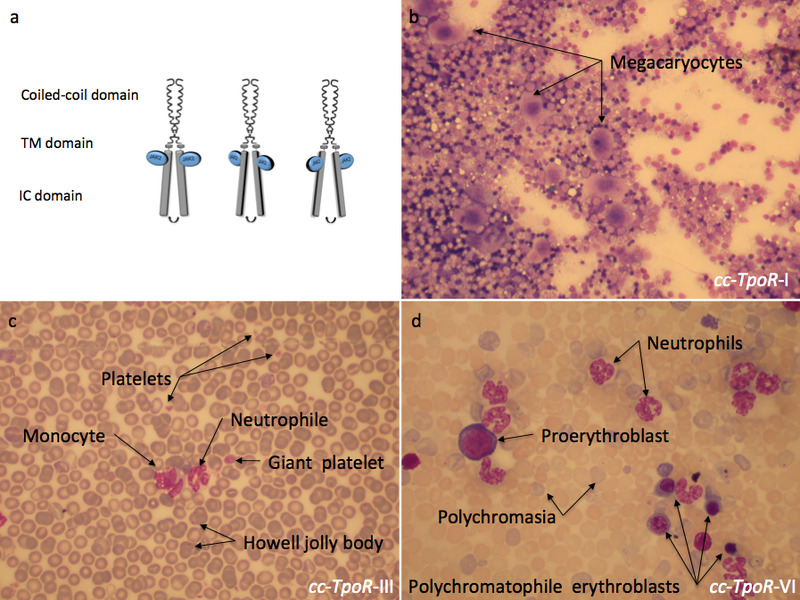 For example some of our TpoR W515 mutants (W515A) are now associated with severe human myeloproliferative neoplasms. But we and others have found that the majority of MPNs are associated with the unique activating somatic mutation in JAK2, JAK2 V617F. This mutation is located in the pseudokinase domain of JAK2. JAKs contain active kinase domains at the C-terminus, but also pseudokinase domains that precede kinase domains, and then regions that are required for JAKs to bind to cytokine receptors (Figure 2). The function of these pseudokinase domains remains unknown, but these domains are required for the normal function of JAKs in cytokine receptor signaling. We also described activating mutations in JAK1 (V658F) and TYK2 (V678F), which are homologous positions to V617F. While the X-ray crystal structures exist for many cytokine receptors, technical difficulties made, up to now, impossible the visualization at atomic levels of the structures of the cytokine receptors' transmembrane and intracellular (cytosolic) domains, or of the complexes between receptors and JAKs. Yet, the signal brought by the cytokines passes via conformational changes of the transmembrane helices to the cytosolic domains and to JAKs. Without an understanding of exactly how residues interact and which structures are adopted, we cannot manipulate these receptors for medical purposes, besides simply changing the levels of cytokines available. In certain situations, partial effects would be beneficial, while full actions induced by cytokines are detrimental. 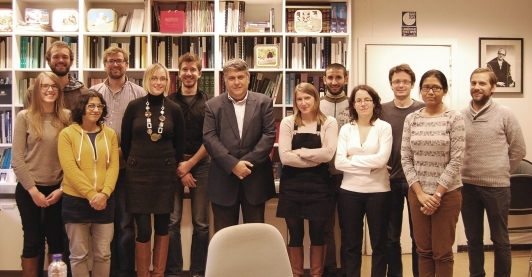 Our broad aims are to: i) understand the rules by which transmembrane and juxtamembrane receptor domains interact and assemble receptors in the membrane; ii) understand how JAKs are interacting with receptors in the inactive and active states; iii) define the role of the pseudokinase domains of JAKs in signaling; iv) define the mechanism by which the V617F mutation in the pseudokinase domain of JAK2 activates the kinase domain, with the goal to be able to isolate specific inhibitors of JAK2 V617F for the treatment of MPNs; v) obtain structural data on complexes of cytokine receptors and JAKs and understand how mutations in W515 of TpoR lead to activation of the receptor in the absence of ligand. In order to pursue these aims we undertake several approaches. First, we established a novel system where we can engineer receptor dimers of known orientations and interfaces. We accomplish this by replacing the receptors' extracellular domains by dimeric coiled coils (pairs of helices) and we engineer junctions between this pair of helices (held strongly together by high affinity repeated sequences) and transmembrane domains. We can engineer for each receptor dimer all seven possible dimeric interfaces and test them in biological assays. This allows us to identify active, inactive and partially active dimeric orientations for several cytokine receptors. Second, we use cysteine scanning mutagenesis and cross-linking in order to prove that interfaces we predict are actually adopted in cell membranes or by full-length receptors. Third, we utilize biochemical, signaling and functional assays to test function of receptor and JAK mutants. Fourth, we utilize mass spectrometry based approaches like PhosphoScan and UbiScan in order to determine which post-translational modifications are induced by cytokine receptors and JAKs in different cells. Fifth, we use primary patient and mouse cells as well as bone marrow transplantation assays in mice (wild type, as well as engineered mice) in order to test our results in in vivo systems and determine which promoters are bound by transcription factors (such as STAT5) and which genes are turned on or off.